Washington, D.C. — NewsMatch, the largest grassroots campaign for nonprofit news, is uniting newsrooms around the country on Giving Tuesday as part of a nationwide #GivingNewsDay to support trustworthy journalism. The day is intended to drive as many donations to nonprofit news as possible to sustain quality journalism that keeps communities informed. #GivingNewsDay will leverage the energy and momentum in the nonprofit community on Giving Tuesday to increase support for nonprofit journalism which covers vital issues facing our nation and local communities, from education to the environment to the economy. #GivingNewsDay is a chance for people to support the issues they care about and the journalists who report on them. NewsMatch is doubling individual donations, up to $1,000, to 155 nonprofit newsrooms, each of which is eligible for up to $25,000 in matching funds through Dec. 31, 2018. Individuals can easily find and support trusted reporting in their community and on issues they care about at newsmatch.org. Donations are tax-deductible as allowed by law. "We are thrilled to see the growth of this year's GivingNewsDay campaign and support its efforts to strengthen nonprofit journalism," said Asha Curran, Chief Innovation Officer at the 92Y’s Belfer Center for Innovation and Social Impact in New York City, the founders of Giving Tuesday. "As millions of people all across the world come together to bolster a myriad of nonprofit and philanthropic causes as part of Giving Tuesday, GivingNewsDay is an important reminder that quality journalism shines a spotlight on those issues every day." NewsMatch is an innovative platform for giving which combines individual donations with foundation and corporate support and long-term capacity building for news organizations. It is driven by the Institute for Nonprofit News and the News Revenue Hub, two organizations helping build more sustainable models for journalism in the U.S.. The campaign is supported by a diverse group of foundations and corporations including Democracy Fund, the Ethics and Excellence in Journalism Foundation, the Facebook Journalism Project, the Gates Family Foundation (through the Colorado Media Project), the John S. and James L. Knight Foundation, the John D. and Catherine T. MacArthur Foundation, the Jonathan Logan Family Foundation, the Wyncote Foundation, and additional supporting partners. The Miami Foundation serves as fiscal sponsor for the fund. “NewsMatch is not just a fundraising campaign for nonprofit news organizations. It’s an opportunity to be part of a movement to build a strong future for quality, trusted journalism. By taking connected action on GivingNewsDay supporters can propel momentum and generate awareness around this important work,” said Karen Rundlet, Knight Foundation director for journalism. Knight Foundation launched the inaugural NewsMatch in 2016, helping 57 nonprofit news organizations raise more than $2.4 million. In 2017, the campaign expanded to include a coalition of funders and helped support important coverage of a wide range of topics including education, immigration, conservation, local government and criminal justice. It raised $4.8 million for nonprofit news organizations, equipped them with professional fundraising, tools and technology and cultivated over 43,000 new donors. Participating nonprofit news organizations are all members of the Institute for Nonprofit News and abide by guidelines of editorial independence and financial transparency. Adirondack Explorer; Baltimore Brew; CivicStory; Connecticut Health Investigative Team; City Limits; Delaware Currents; ecoRI News; Hidden City Philadelphia; Highlands Current; Hummel Report; Investigative Post; Lower Cape TV/Lower Cape News; Maine Center for Public Interest Reporting; Maryland Matters; MarylandReporter.com; NancyOnNorwalk.com; New England Center for Investigative Reporting; New Hampshire Center for Public Interest Journalism; New Haven Independent; NJ Spotlight; Philadelphia Public School Notebook; PublicSource; The CT Mirror; The GroundTruth Project; VTDigger.org; and WHYY. Belt Media Collaborative; Better Government Association; Block Club Chicago; Bridge Magazine; City Bureau; Flint Beat; East Lansing Info (ELi); Iowa Center for Public Affairs Journalism (IowaWatch); KCUR-FM; Madison365; Milwaukee Neighborhood News Service; MinnPost; Eye on Ohio (Ohio Center for Investigative Journalism); South Dakota News Watch; St. Louis Public Radio; The Chicago Reporter; The Midwest Center for Investigative Reporting; Wausau Pilot and Review; WDET Detroit Public Radio; WFYI Public Media; and Wisconsin Center for Investigative Journalism. Alabama Initiative for Independent Journalism (BirminghamWatch); Arkansas Nonprofit News Network; Austin Monitor; Breckenridge Texan; Carolina Public Press; Center for Sustainable Journalism; Centro de Periodismo Investigativo; Charlottesville Tomorrow; Daily Yonder; Florida Bulldog; Florida Center for Investigative Reporting; Georgia Health News; Insider Louisville; Kentucky Center for Investigative Reporting; KYForward.com; LkldNow.com; Mississippi Today; North Carolina Health News; Northern Kentucky Tribune; Oklahoma Watch; Scalawag Magazine; Southern Investigative Reporting Foundation; Texas Observer; The Austin Bulldog; The Frontier; The Lens; and The Texas Tribune. Alhambra Source; Arizona Center for Investigative Reporting; Aspen Journalism; Bay Nature Institute; BenitoLink.com; Borderzine; California Health Report; CALmatters; Crosscut; EdSource; High Country News; Honolulu Civil Beat; inewsource; InvestigateWest; KPBS; Mission Local; Montana Free Press; Mountain Independent; New Mexico In Depth; NowCastSA; Rivard Report; Rocky Mountain Public Media; Searchlight New Mexico; San Francisco Public Press; The Colorado Independent; The Nevada Independent; The Seattle Globalist; TucsonSentinel.com; Voice of OC; Voice of San Diego; Voices of Monterey Bay; WitnessLA; and WyoFile. 100Reporters; Anthropocene Magazine; Center for Responsive Politics/OpenSecrets; Chalkbeat; Civil Eats; Current; Energy News Network; Ensia; FairWarning; Food and Environment Reporting Network; Fostering Media Connections; Futuro Media Group; Grist; Indigenous Media Freedom Alliance; In These Times; Injustice Watch; InsideClimate News; International Consortium of Investigative Journalists; Investigative Reporting Workshop; Mother Jones; MuckRock; Next City; Orb Media; PassBlue; PBS NewsHour; PolitiFact; ProPublica; Public Radio International; Pulitzer Center on Crisis Reporting; Religion News Foundation; Retro Report; Science News; Solitary Watch; The Center for Investigative Reporting; Tarbell; The Center for Public Integrity; The Conversation US; The Forward; The Hechinger Report; The Intercept; The Investigative Fund at The Nation Institute; The Marshall Project; The New Food Economy; The Trace; The War Horse; Threshold; Washington Monthly; and Youth Radio. Democracy Fund is a bipartisan foundation established by eBay founder and philanthropist Pierre Omidyar to help ensure that our political system can withstand new challenges and deliver on its promise to the American people. 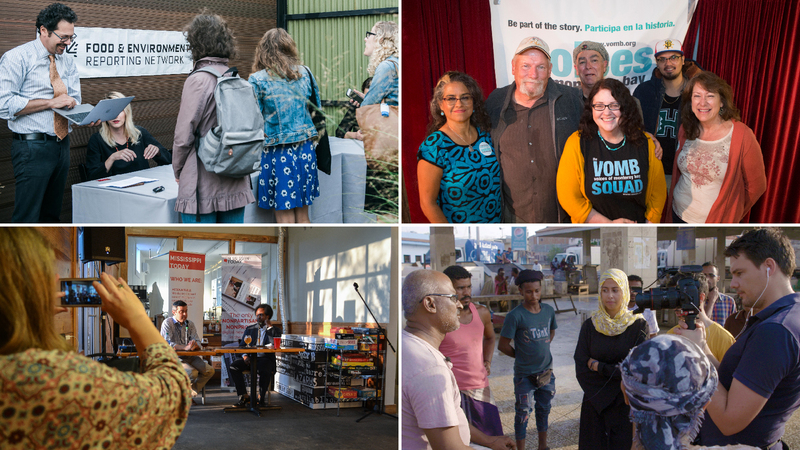 Since 2011, Democracy Fund has invested more than $100 million in support of effective governance, modern elections, and a vibrant public square. For more, visit democracyfund.org. The Gates Family Foundation is a place-based philanthropy dedicated since 1946 to advancing long-term quality of life in Colorado, through support for educational equity, vibrant and sustainable communities, and stewardship of the state’s extraordinary natural resources. The Foundation has supported public and independent media for decades, especially as vital issues such as public education, rural issues, and natural resources have faced decreasing media coverage from commercial outlets. Gates also provides underwriting support for the Colorado Media Project, which aims to strengthen and accelerate sustainable, civic-minded journalism that meets the information needs of Coloradans in the digital age. The Institute for Nonprofit News is a network of more than 190 nonprofit, nonpartisan news media, together strengthening the sources of trusted information for thousands of diverse communities. INN was founded in 2009 to foster a new collective of newsrooms serving the public interest. Today it functions as an innovation network, helping members develop new ways to support journalism and engage communities, providing business, technology and leadership support and a framework for collaboration. INN’s work helps newsrooms bring investigative and civic news to more people, hold the powerful accountable and strengthen democracy. The MacArthur Foundation supports creative people, effective institutions, and influential networks building a more just, verdant, and peaceful world. MacArthur is placing a few big bets that truly significant progress is possible on some of the world’s most pressing social challenges, including over-incarceration, global climate change, nuclear risk, and significantly increasing financial capital for the social sector. In addition to the MacArthur Fellows Program, the Foundation continues its historic commitments to the role of journalism in a responsible and responsive democracy, as well as the strength and vitality of our headquarters city, Chicago. More information is available at macfound.org. Founded in 2016 and based in Berkeley, CA, the Jonathan Logan Family Foundation supports organizations that advance social justice by promoting world-changing work in investigative journalism, the arts, the environment, education, equity and inclusion and documentary film. Founded by Edith Kinney Gaylord, Ethics and Excellence in Journalism Foundation’s mission is to invest in the future of journalism by building the ethics, skills and opportunities needed to advance principled, probing news and information. For more, visit journalismfoundation.org. Since 1967, The Miami Foundation has used civic leadership, community investment and philanthropy to improve the quality of life for everyone who calls Greater Miami home. We partner with individuals, families and corporations who have created more than 1,000 personalized, philanthropic Funds. Thanks to them, we have awarded over $250 million in grants and currently manage more than $300 million in assets to build a better Miami. As the Foundation marks our 50th anniversary, we are celebrating great Miamians who have championed what matters to them, encouraging all residents to share their Miami stories and unite around the causes they care about. For more, visit miamifoundation.org. The Wyncote Foundation, based in Philadelphia, was founded in 2009 with funds from the Otto and Phoebe Haas Charitable Trusts, at the direction of John C. Haas. Its mission is to support efforts that strengthen and enrich culture, community and the natural environment. Wyncote’s Public Media & Journalism program works to further a thriving public media ecosystem that is vital to animating and sustaining democracy’s public sphere. Learn more at wyncotefoundation.org/public-media-journalism.